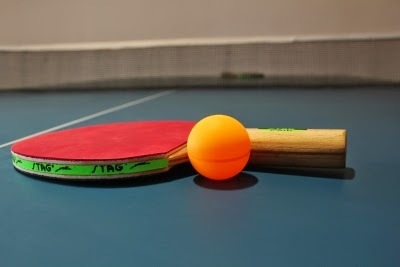 Frenaz Chipia won a grand triple at the Gujarat State Ranking Table Tennis Tournament at Bhavnagar. In each of the finals, she beat Hely Shah. Hely Shah can take some comfort since she beat top seed Sapna Sharma in the semi finals. Frenaz was recently attending the camp at Indore for Indian probables and seemed to be super sharp in her play. In the Men's finals, Devesh Karia beat Ravi Joshi 4-2. Cadet Boys : Manush shah (Baroda) bt. Parag Chandalia(Bhavnagar) 9-11,11-7,11-2,11-3,11-8. Youth Boys : Ravi Joshi (Bhavnagar) bt. Harsh Sachnandani(Surat) 13-11,12-10,11-6,9-11,11-8. Mens Singles : Devesh Karia (Bhavnagar) bt. Ravi Joshi (Bhavnagar) 11-6,8-11,8-11,11-4,11-3,11-4. Junior Girls : Final : Frenaz Chhipia(Surat) bt. Hely Shah(Ahmedabad) 11-8,11-9,11-6,11-8. Youth Girls: Frenaz Chhipia(Surat) bt. Hely Shah(Ahmedabad) 9-11,13-11,11-7,12-10,11-8. 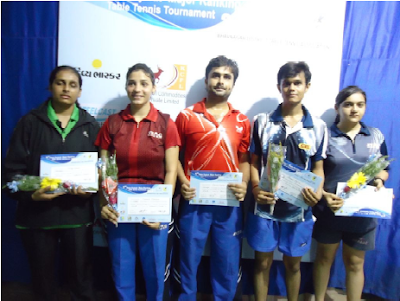 Women Singles : Frenaz Chipia ( Surat) bt Hely Shah (Ahmedabad) 11-8, 9-11, 6-11, 11-4, 13-11, 11-6.